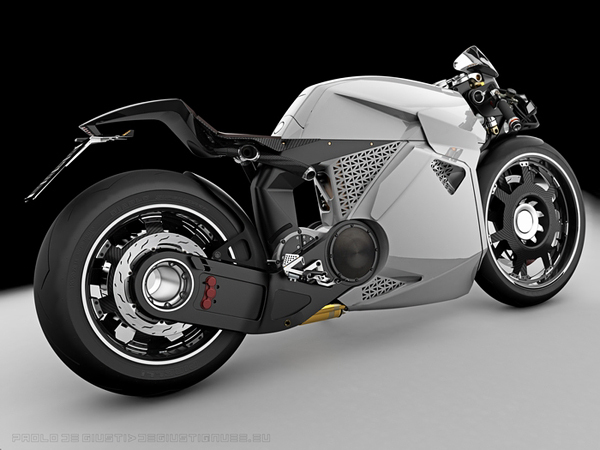 Let us show you very interesting concept of electric motorcycle created by industrial designer from Italy Paolo De Giusti. Massive corp, aggresive look and at the same time eco-friendly concept. Unusual combination, don’t you think? 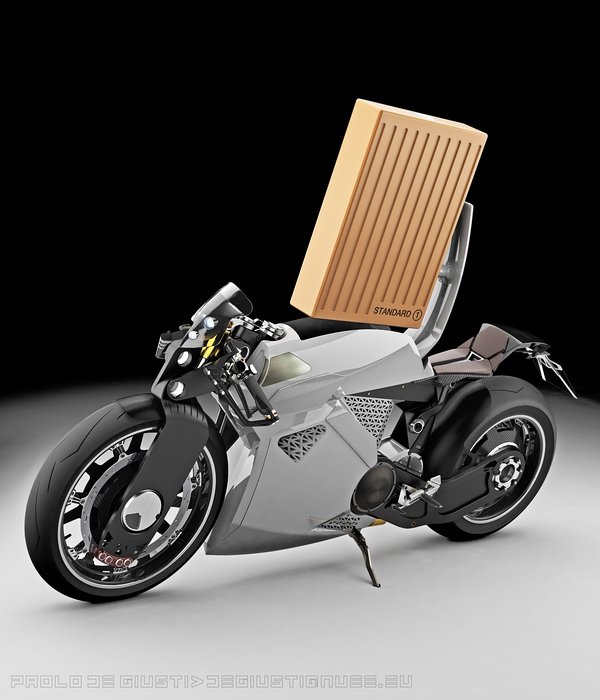 As designer noted this is "innovative electrical motorcycle with a new “;Shared Battery” system”. More about this system from author of this concept Paolo De Giusti you could read below (see first comment). We just have to wait until this concept turns into life. 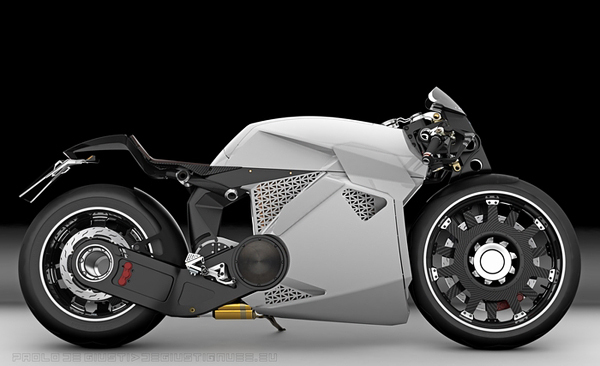 Amazing electric bike! 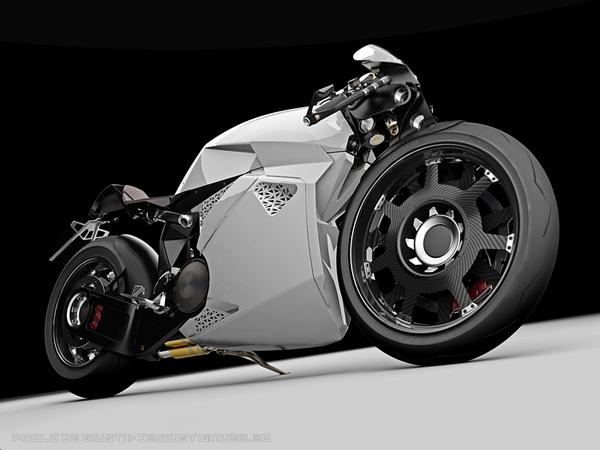 I think in coming years we are going to see this on our roads. 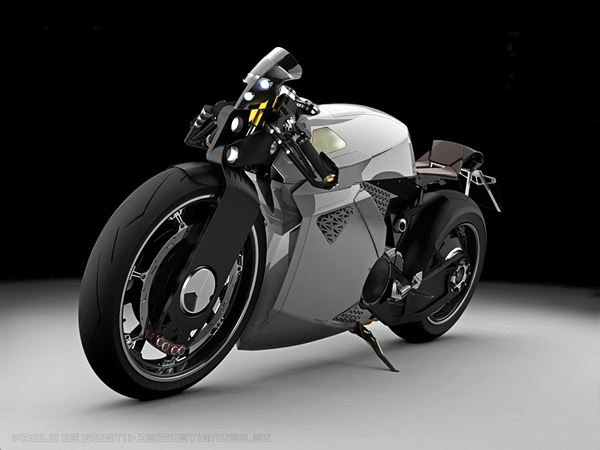 I think i have seen a concept design of a bike that has electric motors mounted within the two wheels of the bike in order to provide direct power to the bike. Thanks for posting. It is very interesting to experiment with new forms, seeking the appropriate signs for new electric vehicles. One big problem of Electric bikes is the time to recharge the battery. With a system of shared battery, a standard battery is recharged in an Automatic Robot Station (Used also by Cars ) , and you can mount another identical battery load 100% and pay only for the used energy (remaining battery energy is reused). With this system you can keep the old network of petrol stations, furthermore, the battery in the new electric vehicles is comparable to a conventional engine, I mean that the performance of Motorcycle derived mostly from the battery and not from the engine, so every time you will have a technological evolution of these batteries these can be used also in “old” motorcycle to improve performance, in this way you can save your vehicle from a fast obsolescence. and in coclusion this allows the State to control the energy for vehicles, differentiating it from home use, I also hate this control, but actually many states have heavy taxes on fuel and prevent the electric revolution to avoid losing money. Follow this link to see a sequence of charging the battery.